Home › Relationship Skills › Romance for Marriage Minded People: Fantasy or Reality? Romance for Marriage Minded People: Fantasy or Reality? Below are some of my thoughts about romance, what it means to be romantic, and what makes someone romantic or not, especially as a marriage minded person. – Romance is a state of mind– a way of being, the way you look at life and its action- what you do for your partner. For instance, texting your partner, “good morning” to touch base daily or wanting to plan a weekend getaway is considered thinking romantically. – Romance is giving special attention to someone you care deeply for. What does that special attention look like? Spending one on one time together where you are delighted to be in each other presence no matter the other demands on one’s life. It’s paying attention to the little things, her favorite coffee, his favorite Italian dish and bringing dinner to her when she has to work late. Looking lovingly at your partner. – Romantic gestures like giving your sweetheart flowers, writing poetry or love notes and buying gifts makes someone feel special and that she (or he) matters. The effort and time spent planning the gesture is important, as well. – Romance is as real as you want to make it. There are some people who strive to live a romantic life and they design their life to make it happen. They just need a responsive partner that cares about romance as much as they do. – There are different degrees of romance. There are the everyday little things you do such as giving her a foot massage or bringing her a box of her favorite chocolates. Then there are the grand gestures that marriage minded people make such as an airplane flying by with a sign saying “Will you marry me?” at the right planned time and place. – Personally, I also think that in order to support a romance in your relationship, it requires TIME. This is what many couples are missing with one another- quality time to be romantic and think romantically. Romance takes time and space. Time to ponder and dream, and then create romance opportunities. We have many demands on our time- with more disruptions and the fast pace of life. Both people need to put time and attention into being romantic- that is when the magic happens! – For marriage minded people there is a no one size fits all to being romantic. Different people respond to different gestures. Take the time to explore what your partner consider romantic and what they enjoy. So how do you see romance in your life? How do you want your partner to be romantic with you? How can you add some romantic spice to your life? It’s up to you to create the opportunity for passion to occur. I hope you will join me for my Google Hangout interview on Wednesday, April 1 to learn more about The 3 Keys to Finding Lasting Connection when Dating for Love and Marriage. Sign up to get access at https://motivatedtomarry.com/passionsummit. There is so much more for me to share with you! PS. 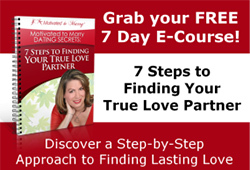 My interview is only up for a 48 hours free or you can purchase the replay video series to watch all the great love and romance experts in this online summit! https://motivatedtomarry.com/passionsummit. ‹ Who’s Your Dating & Relationship Coach?